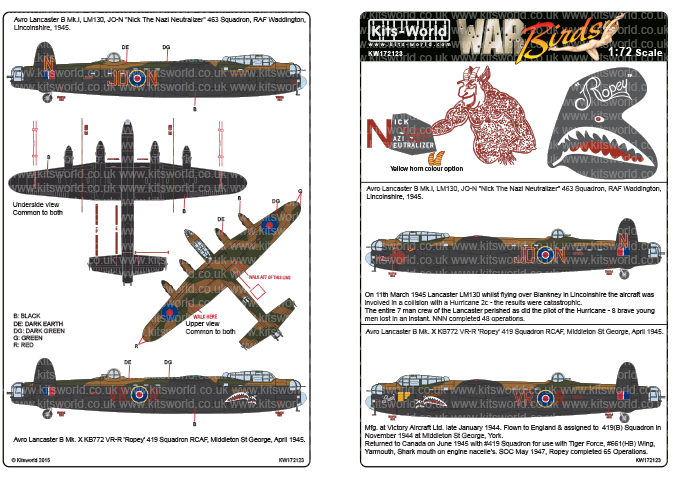 Avro Lancaster B. Mk. 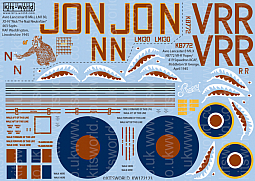 VII, NX611, 'Just Jane' LE-C/H DX-C/F Lincolnshire Aviation Heritage Centre, East Kirby England, 2014. 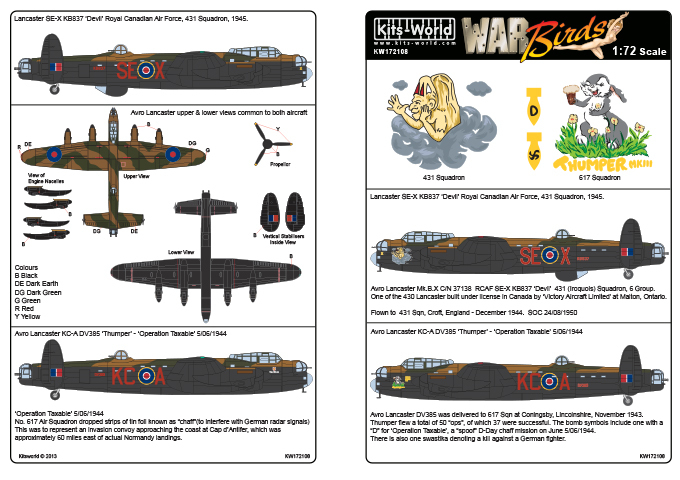 Avro Lancaster B. Mk. X, KB726 VR-A, 419 (Moose) Sqn, RCAF Canadian Warplane Heritage Museum, 2014. 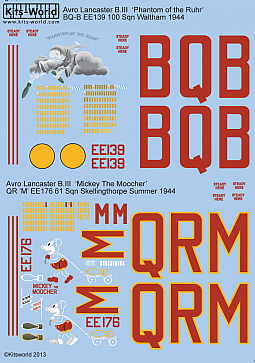 Avro Lancaster B. Mk. I, PA474 KC-A 'BBMF DV385 Thumper III' England 2014. 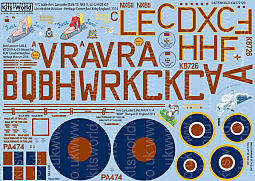 KW172121 12 Squadron Avro Lancaster PH-H - Panavia Tornado GR.4 1915 -2014 Scheme. Avro Lancaster B.III LM321 PH-H, 12 Sqn, Wickenby, England 1942. 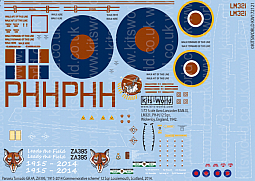 Panavia Tornado GR.4A ZA395 'Commemorative scheme' 1915-2014, 12 Sqn Lossiemouth Scotland 2014. Avro Lancaster B Mk.I, LM130, JO-N "Nick The Nazi Neutralizer" 463 Squadron, RAF Waddington, Lincolnshire, 1945. 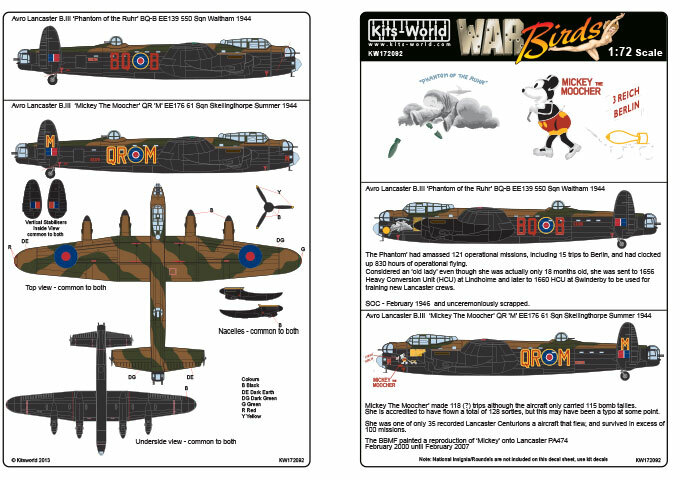 Avro Lancaster B Mk. X KB772 VR-R 'Ropey' 419 Squadron RCAF, Middleton St George, April 1945. 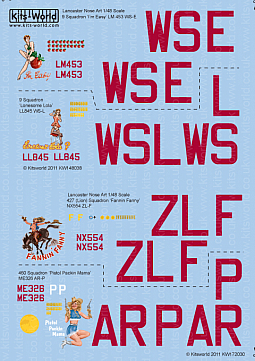 Erratum - Title should read 1/72 scale on decal sheet. In February 1939, the Squadron moved to Honington received Wellingtons, and it was with these that it was involved in anti-shipping sorties in the early stages of World War II. These were replaced in turn by the famous Lancaster bomber in September 1942 and the unit became part of Bomber Command's strategic offensive against German targets and was now based at Waddington. Following a move to nearby Bardney, No. 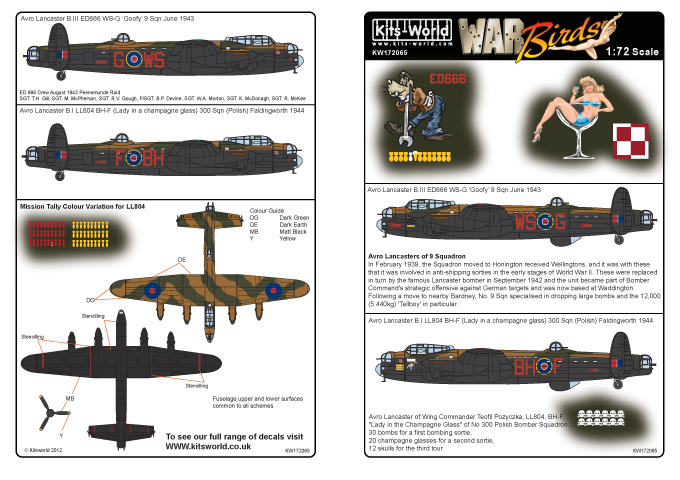 9 Sqn specialised in dropping large bombs and the 12,000 (5.440kg) 'Tallboy' in particular. On the night of 4th 5th July 1944, Bomber command sent a force of 231 Lancaster's and 15 Mosquito's to attack the V1 supply depot at Saint Leu D'Esserent. With the target area having been identified previously, the air crews mapped their route in order to miss major towns and known flak installations which they might encounter over France. What had not been foreseen was the amount of Luftwaffe fighters which had been assembled to defend the supply depot. This force would have a serious outcome with no less than 13 RAF Lancaster's being shot down over occupied territory.The bombing raid over Saint Leu D'Esserent was planned at night with the 'bombs away' set for 01H45 am. This particular night was a clear sky with bright moonlight. The attacking force assembled over England between 23h30 and started it journey over the English Channel and the French coast. 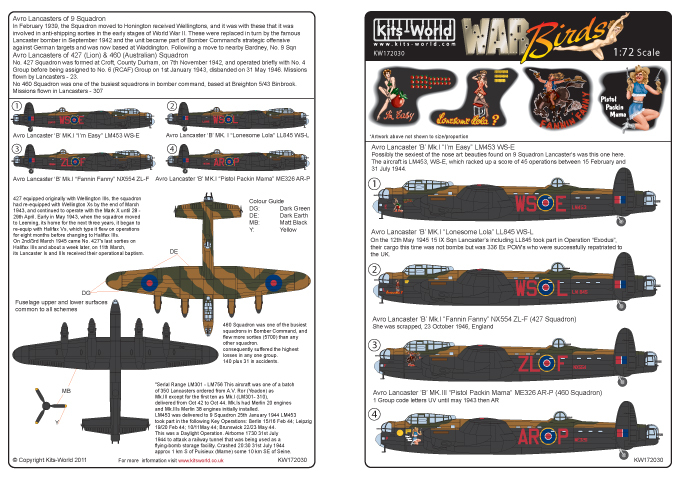 Avro lancaster Bomber 'Lonesome Lola' LL845 WS"L"
This aircraft replaced Lancaster Mk111 W5010 WS"L" which failed to return from an operation to Leipzig on the 19/20th February 1944. LL845 undertook its first operation with IX Sqn on the 15/16th March 1944 when P/O Clark and crew (including F/O Matthews) took it to Stuttgart, this was P/O Clarke's 10th operation. 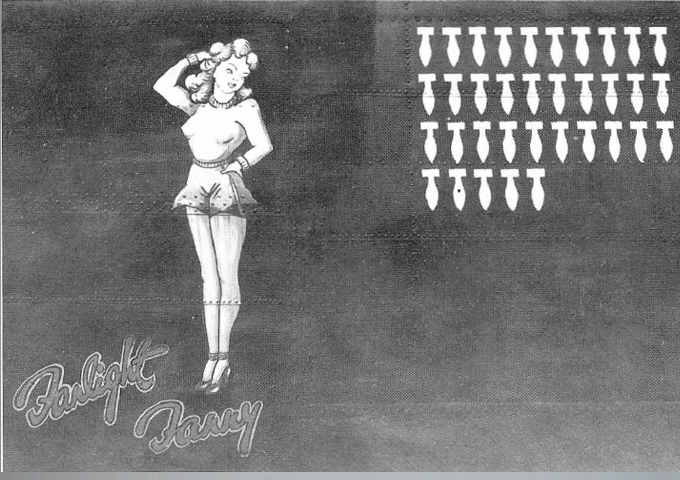 The artwork on the photograph shows 8 bombs which indicates that it had carried out 8 operations, the records show that the 8th operation was carried out on the 10/11th April 1944 when Ft/Sgt Horne and crew took it to Tours. The 9th operation was carried out on the 11/12th April when P/O Clark and crew (including F/O Matthews) took it to Aachen . 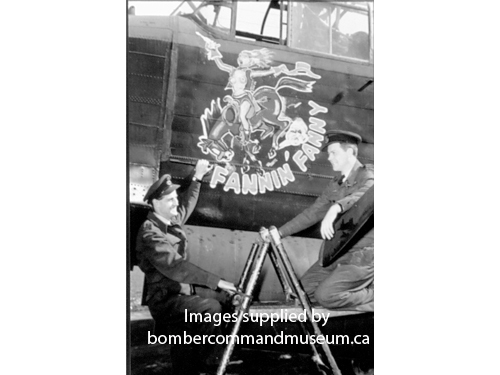 Assuming the art work (bombs) were added/painted after each operation the photograph must have been taken on the 11th April 1944 prior to P/O Clark undertaking the operation to Aachen. LL845 operated with IX Sqn until the end of the war. On the 15th September 1944 S/L Pooley and crew flew it to Yagodnik in Russia for the first Tallboy" operation against the German Battleship Tirpitz" by IX and 617 Sqn's. W4964 WS"J" another IX Squadron Lancaster was the only aircraft to obtain a direct hit on the Tirpitz" during this operation, this caused the Germans to take it further South to Tromso hopefully for repair, however this became within range of Lancaster's flying from a forward base in Scotland if the mid upper gunner was taken out and extra long range petrol tanks were inserted into the fuselage. Two more Tallboy" operations were undertaken by IX and 617 on the 29th October and finally on the 12th November 1944 when it was capsized. LL845 took part on the 29th October operation but was iced up and could not take off on the 12th November. LL845 carried out its last wartime operation on the 25th April 1945 when F/L McIntosh and crew took it to Berchtesgaden . 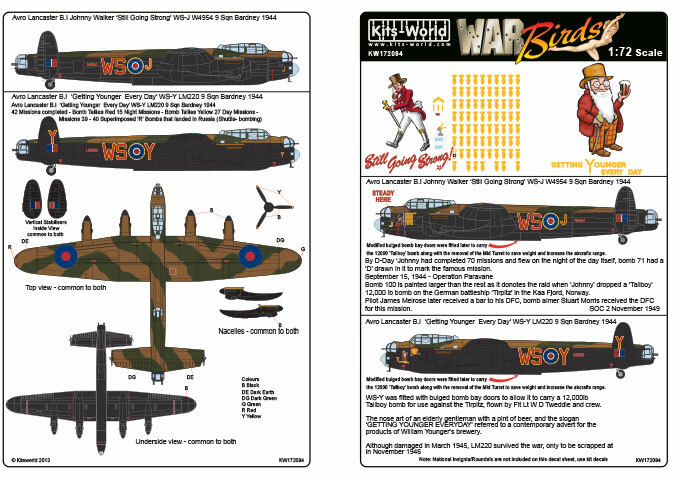 427 equipped originally with Wellington IIIs, the squadron had re-equipped with Wellington Xs by the end of March 1943, and continued to operate with the Mark X until 28 - 29th April. 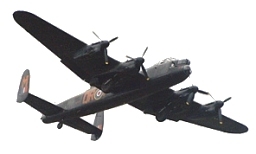 Early in May 1943, when the squadron moved to Leeming, its home for the next three years, it began to re-equip with Halifax Vs, which type it flew on operations for eight months before changing to Halifax IIIs. On 2nd/3rd March 1945 came No. 427's last sorties on Halifax IIIs and about a week later, on 11th March, its Lancaster Is and IIIs received their operational baptism. 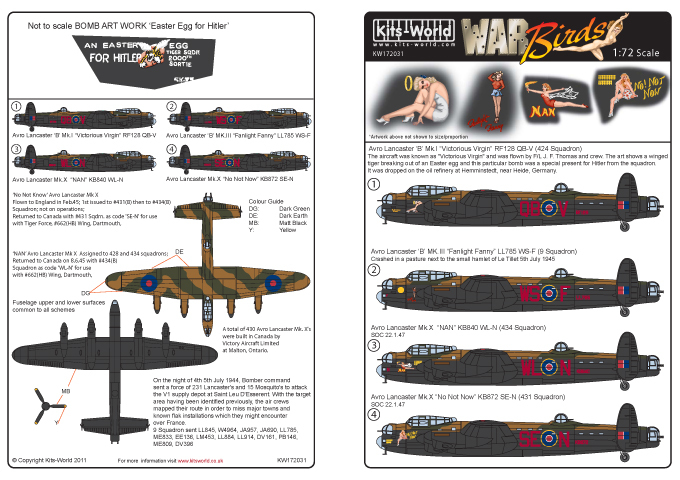 Matthew Ferguson practiced his craft from 1941 until 1945, painted on at least four different types of aircraft, developed station and squadron badges, pioneered placing artwork on bomber jackets worn by aircrew, and even painted artwork on bombs. An Albertan, he was clearly the most significant Canadian nose artist of the Second World War and likely in the history of the art form. After emigrating from England as a small child, Matthew Ferguson was raised in Calgary, Alberta where he enlisted with the Calgary Highlanders when war broke out. 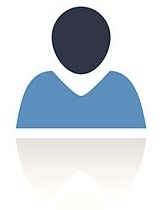 Six months later he transferred to the Royal Canadian Air Force and became an airframe mechanic. Matthews Ferguson painted this artwork on a 4000 pound "cookie" bomb to celebrate the 2000th operation by No. 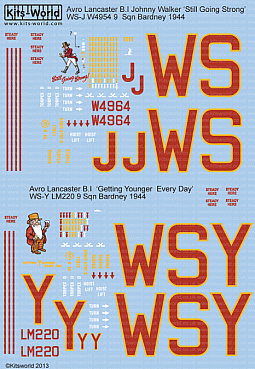 424 "Tiger" Squadron. 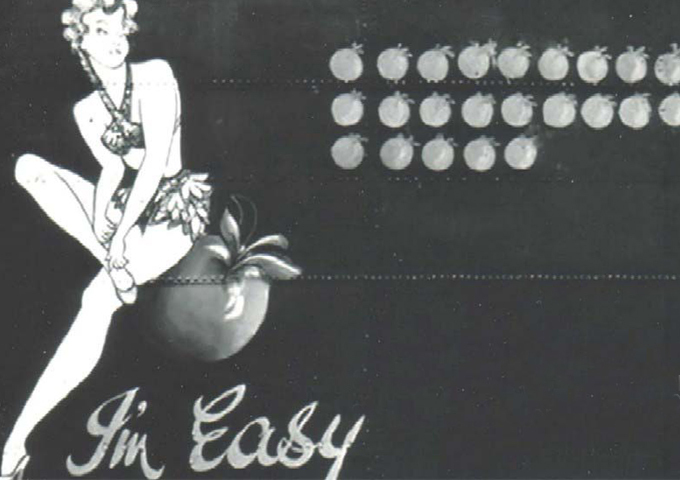 A photograph was taken and then the bomb was loaded into Lancaster RF-128 (QB-V) and delivered on 21 March 1945. The aircraft was known as "Victorious Virgin" and was flown by F/L J. F. Thomas and crew. 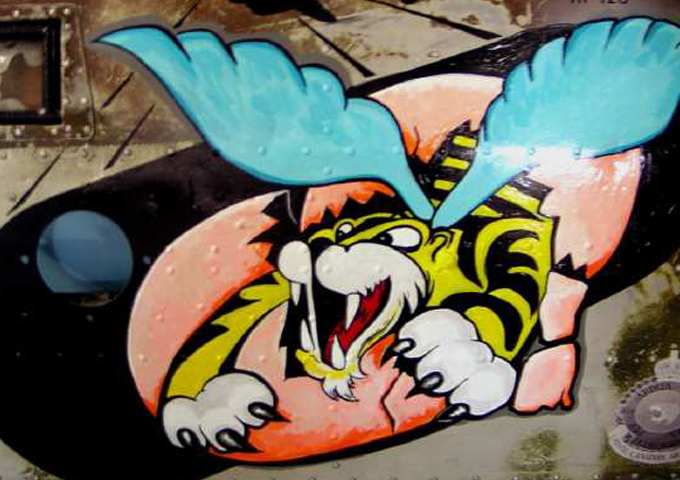 The art shows a winged tiger breaking out of an Easter egg and this particular bomb was a special present for Hitler from the squadron. It was dropped on the oil refinery at Hemminstedt, near Heide, Germany. 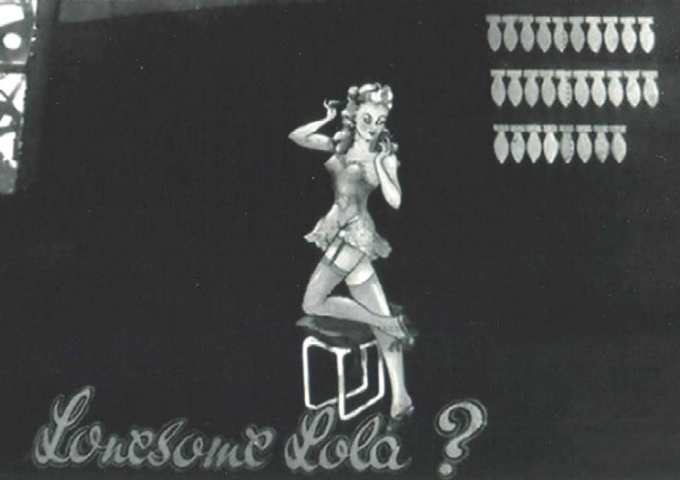 The nose art image on the Lancaster was based on the November 1944 "Varga" pin-up that appeared in Esquire magazine. Ferguson's "Victorious Virgin" flew the squadron's 2000th four-engined sortie on 21 March, 1945. The 4000 lb. 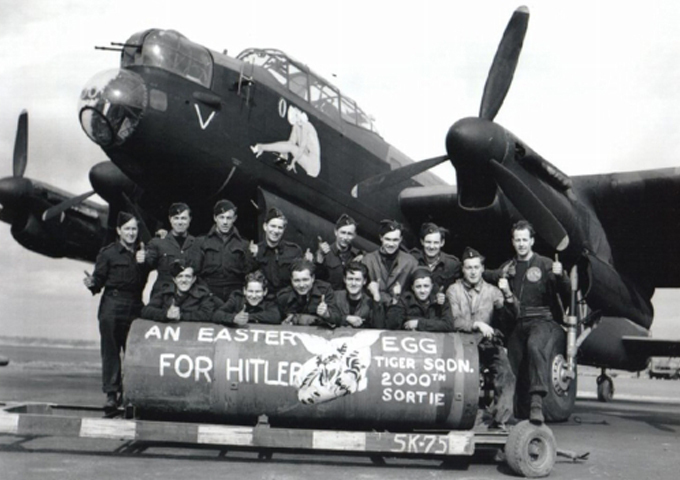 "cookie" bomb was painted by Ferguson and labelled, "An Easter Egg for Hitler." 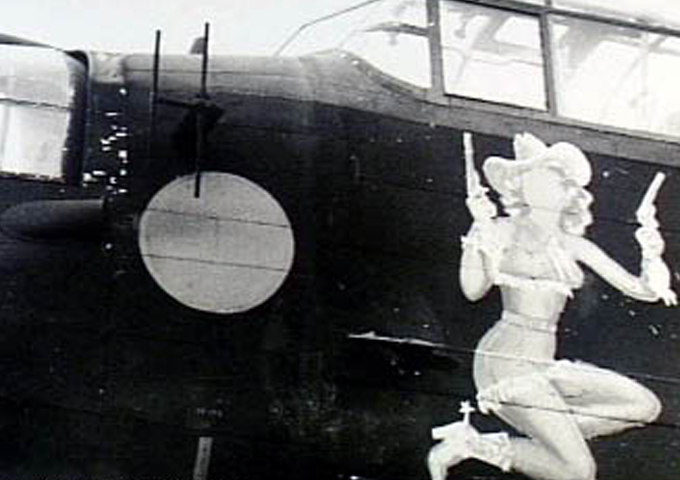 This is the only known example of 'nose art' on a bomb. 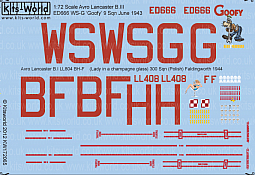 On the night of 4th 5th July 1944, Bomber command sent a force of 231 Lancasters and 15 Mosquitoes to attack the V1 supply depot at Saint Leu D'Esserent. With the target area having been identified previously, the air crews mapped their route in order to miss major towns and known flak installations which they might encounter over France. What had not been foreseen was the amount of Luftwaffe fighters which had been assembled to defend the supply depot. This force would have a serious outcome with no less than 13 RAF Lancasters being shot down over occupied territory. 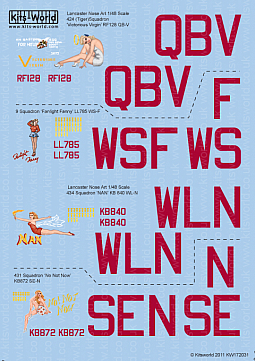 9 Squadron sent LL845, W4964, JA957, JA690, LL785, ME833, EE136, LM453, LL884, LL914, DV161, PB146, ME809, DV396. 9 squadron lost Lancaster 'Fanlight Fanny' LL785 WS-F which crashed in a pasture next to the small hamlet of Le Tillet killing all onboard. 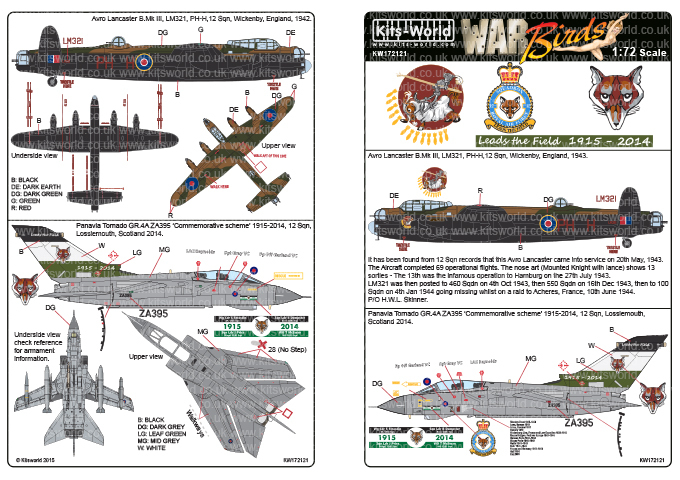 A total of 430 Avro Lancaster Mk. X's were built in Canada by Victory Aircraft Limited at Malton, Ontario. The first order placed was for a total of 300 aircraft. Their serial numbers were from KB700 through KB999. 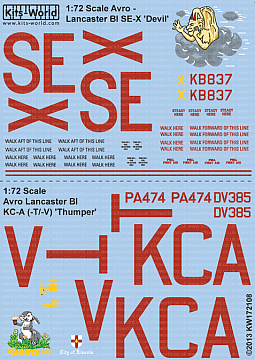 These Lancasters were delivered between September 1943 and March 1945. 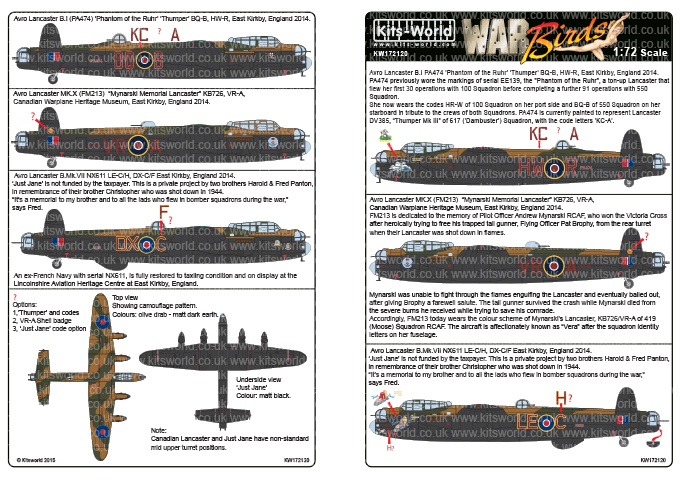 The Lancasters with serial numbers KB700 through KB774 were fitted with Merlin 38 engines. All subsequent aircraft were fitted with Merlin 224's. 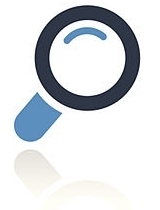 None of the 430 aircraft were lost while being tested at Malton. Almost all of the Lancaster Mk. X's were ferried to England and none were lost in transit.